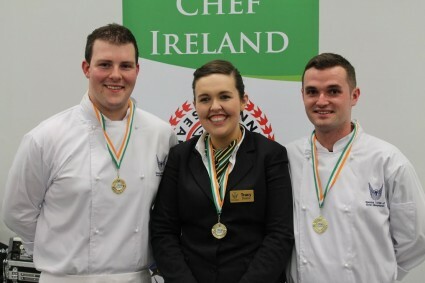 A team of students from Shannon College of Hotel Management won gold at the Chef Ireland competition at Hospitality Expo in the RDS last week. Over 200 entries were received by Chef Ireland for the eleven categories of culinary competitions for senior professionals and junior chefs. 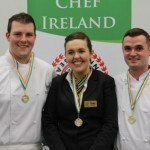 Chef Ireland is one of the largest and most prestigious national competitions for professional chefs in Ireland at both senior level and the annual event attracts entries from leading restaurants and hospitality establishments across the country. The Shannon College team included David Wallace from Bunratty (Co Clare), Tracy Deane from Kellistown (Co Carlow) and Peter Searle from Castlegregory (Co Kerry). The students were coached by Shannon College lecturers Mr Andrew Langford, Chef Sarah Ryan and Chef Sean T Ruane who mentored the students throughout the preparation and training in the weeks leading up to the competition.